ISDN*tek offers Free Shipping Calculator and Gallery Creator software too! Check Tags. For quick checking, simply download this tiny program and run your HTML code through it. You will get a formatted listing and report of mismatched tags to help you clean up your web page problems. The alignment feature provides guidelines to help search out misaligned (improperly nested) tags. The program will tell you which tags are out of order, which will help you locate your missing tags. Preview Code as Web Page. The program also lets you preview your code in your browser, which means you can type and test code segments or whole pages. Need Help? Click here for some handy RagTag tips. Enhanced features are included for users who want a little more power and flexibility when hand-coding HTML. They include file saving options, find and replace in any window, and a source code wordwrap option to make it easier to see all your code without panning right. Shortcut Keys. A whole set of preset shortcut keys speed up coding by putting common codes on a key. 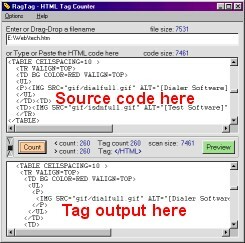 30 Redefinable Ctrl-key codes let you quickly and easily surround your selected text with HTML pairs. 4 special keys insert <br> &nbsp; &lt; and &gt; codes. One special key lets you define and insert an HTML code pair on-the-fly. 12 Macro shortcuts remember large chunks of text or code for reuse on your pages. The 3 "cut/paste/selectAll" ctrl-keys can be preserved or can be assigned to shortcuts. Special Entities & ASCII character codes. 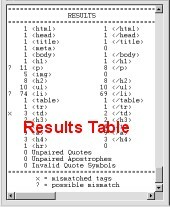 A built in table helps you find the HTML codes for those special symbols like Hearts, Diamonds, Cents, and Copyright. Another table has the complete 255-code set for ASCII and hexadecimal codes that are used to replace characters in URLs and on web pages. Easily find the code for the character or the character for the code. Enhanced Scan Options. The enhanced code scanner will check for improper table nesting and for tags that do not belong on an auction page. Problem codes can be added to the list. Block comments allow whole sections of code to be skipped during scanning, and error location numbers make it easier to find and fix the problems in the source code. RagTag will also export a formatted and error-annotated file. The exported file can be fed back into RagTag for additional editing, and more passes through the code scanner, without the need to strip the error messages. Code Poster. The code poster option is ideal for posting code examples on web pages or on chat and discussion boards. The code poster will convert functional codes into benignly viewable codes, and has five reconfigurable formatting options. Converted code has a preview option so that you can see what it looks like before inserting it in your page. Free Download. This is a the "Enhanced" version of <RagTag>TM. (The older "lite" version is here.) You will download a self-installing file that will create a RagTag directory and place the program there, so you will need to save the installer in a directory on your hard drive or desktop where you can find it. The installer can be deleted once the program installs. By downloading this file you agree not to distribute this program, but you may refer others to this location. There are no hidden attachments, adware, or spyware in any of our site downloads. PC Running Windows 98, NT, 2000, XP, etc. Netscape Navigator or MS Internet Explorer (browser optional). Look in: Drive C: or all hard drives. If you have not found the Microsoft System Files on your PC, you may download them here. These files should be placed in your WinNT\System32 (or Windows\System) directory if they do not already exist there.